Bulltraders is a forex broker. Bulltraders offers the BULLTRADER and Mobile trading currency platforms. 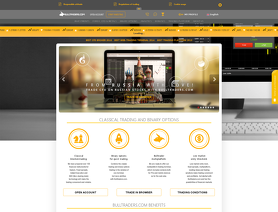 Bulltraders.com offers currency pairs, bitcoin, indices, cfds, oil, binary option, gold and silver for your personal investment and trading options. DO YOU RECOMMEND THIS COMPANY? Let other traders know if this service is worth checking or should be avoided. Please stay away from this broker. They have stolen all profits I made with no reason. I had made good quality trades, but at the end of the day when it came time to pay out the profits I made, they refused. They then closed my account. Another glitch that this company has is that they do not allow you to withdraw more than $100 per transaction 3 times a day. So if you deposited $1000, it would take TEN separate processes over 4 days to get your DEPOSIT out. They are a crooked organization. Stay away at all costs. Trading FX or CFDs on leverage is high risk and your losses could exceed deposits. ForexPeaceArmy.com has advertising and affiliate relationships with some of the companies mentioned on this site and may be compensated if readers follow links and sign up. We are committed to the fair handling of reviews and posts regardless of such relations. © Copyright www.ForexPeaceArmy.com. All rights Reserved. ™Forex Peace Army, ForexPeaceArmy, FPA, and the FPA Shield Logo are all trademarks of the Forex Peace Army. All rights reserved under US and international law.